The color of urine is normally clear to pale yellow to very dark yellow, depending on your hydration, activity level, and diet. The bright yellow to fluorescent green color sometimes seen when taking nutritional supplements is primarily caused by some excess nutrients being excreted (particularly riboflavin and other B vitamins), and it may continue to vary in color based on your hydration and nutritional need. Supplements do not typically have a significant effect on urinary frequency. Although vitamin C and caffeine found in some supplements can be mild diuretics, increases in urination frequency are more likely related to increased water consumption. Many people add 2-3 extra glasses of water throughout the day when taking supplements. 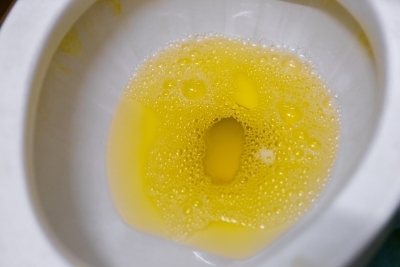 The consumption of vitamins, minerals, and some plant extracts can change the smell of urine. This is not an indication of anything unhealthy or of concern, changes in urine odor can also occur when people eat beets, asparagus, garlic, onions, fish, etc.